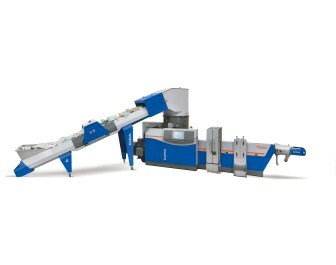 Austrian recycling technology supplier EREMA will present its latest technologies and in-house recycling systems in live demonstrations at CHINAPLAS 2013.EREMA will be running a 756 TE system with printed polyethylene production waste during the exhibition. One of EREMA’s users, Uflex, based in India, produces chemically refined and multiple-layer printed plastic packaging (BOPP, BOPET, laminated and metallized film, etc.). It has been running EREMA’s TVEplus recycling systems for its production since 2009, using the technology to reprocess these waste plastic materials into high quality recycled material. According to EREMA, TVEplus technology offers efficient filtration, homogenization and degassing for all film wastes, regardless of shape, properties, size and degree of contamination. Even full-surface and multiple-layer printed film waste can be processed in a single pass to make high quality recyclates which can be returned up to 100% in the production loop.